The neatly kept buildings, glowing green fields and the 1910 extant barn on John and Suzanne Smucker’s Lamb Farm are mute testimony to such careful detail awareness in all aspects of the carefully maintained landscape. John Smucker explains that he and his wife were, “always orientated to organic food, so we thought that would make sense.â€ Lamb Farm began in 2001 growing organic soybeans and rye, but soon the Smuckers realized the benefits of using their land as pasture. Today their 180 acres of carefully cultivated fields provide food for around 40 cattle, 60-plus ewes and more than 100 lambs. Based on Joel Salatin’s Polyface Farm rotational grazing model expounded upon in Michael Pollan’s The Omnivore’s Dilemna, Smucker cordons off his pastures into 5-acre plots and rotates the cows and the sheep every four to five days. 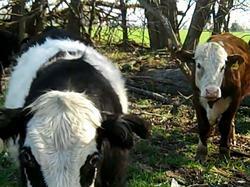 “Our model is basically his model, we do interspecies grazing on a smaller scale.â€ Interspecies rotational grazing encourages a wide variety of different plants, plant diversity increases in pastures that have been allowed to rest between grazings, and often weeds like dandelions and quackgrass are removed by the ruminating masses - to their dietary benefit. The lambs are kept with their mothers in the lambing pens for two weeks until they are moved outside to the fields. A lamb only qualifies as such until age one, “things happen physiologically to the animal at that point, the hormones start and that changes the taste of the meat.â€ The lambs are processed at about 6-8 months old. Smucker spaces out the delivers to the processing facility so that there is only a short gap in availability during the year. 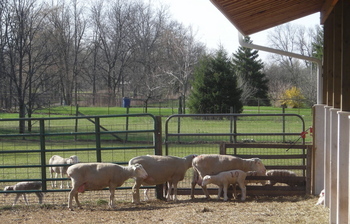 Because the lambs are cared for by the Smuckers from day one, they are able to be certified organic. Smucker also offers to the steers kelp and minerals in the form of salt licks. As we watch the cows skip down the hill Smucker pontificates: “you can see how much energy they have. According to the butcher the density of their bones and tissues is different from many animals. I think it is a function of the minerals we feed and how much moving and running around they have.â€ After 18-20 months of moving around, the cattle are harvested at about 1,100 pounds. This is a significant time investment compared to feedlot beef (harvested at 12 months) or “grass-fedâ€ beef augmented with a diet of grain towards the end of their lives (harvested at 14-16). 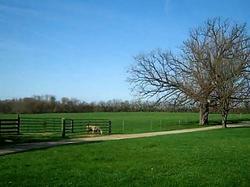 Lamb Farm uses a processing facility that is USDA certified and organic. Smucker delves into the challenges of following such a regime. “There are only two organic processing facilities in the state. There is certainly a bottle-neck issue that has gained national attention. A lot of places have decided that the USDA stuff is too arduous, the paperwork is too much.â€ However, sticking with their promise “to maintain an ethic of whatâ€ they are up to, Smucker pays the extra fees for the USDA stamp. That USDA stamp enables all of the meat to be legally sold at Arbor Farms, Smucker’s retail partner. “Just my wife and I are the full time employees,â€ Smucker explains, “we don’t have the capacity to do retail sales. We got too many things to do, selling is a whole different business.â€ Smuckers drops off the animals at the facility and Arbor farms picks up the carcasses. Here is the link to the article on annarbor.com.